Charles Jervas's portrait, in which the poet strikes his favourite meditative pose, was painted just as Pope had begun his translation of Homer's Iliad. The unusual composition may refer to the conflict between fame, represented by the bust of Homer in the top-left corner, and private friendship, symbolised by the figure of the woman who may be a portrait of Pope's close friend Martha Blount. More detailed information on this portrait is available in a National Portrait Gallery collection catalogue, John Kerslake's Early Georgian Portraits (1977, out of print). An ailing Queen Anne is unable to attend a thanksgiving ceremony at St. Paul's in July to celebrate the treaty of Utrecht, attended by both Houses of Parliament in full state. John Churchill, Duke of Marlborough, on self-imposed exile on the continent, is joined by his wife, Sarah Churchill. Literary fraternity, the Scriblerus Club is founded. Consisting of satirists, including Jonathan Swift, Alexander Pope and Thomas Parnell, the club ridiculed current trends in scholarship and culture through the fictitious literary character, Martinus Scriblerus. 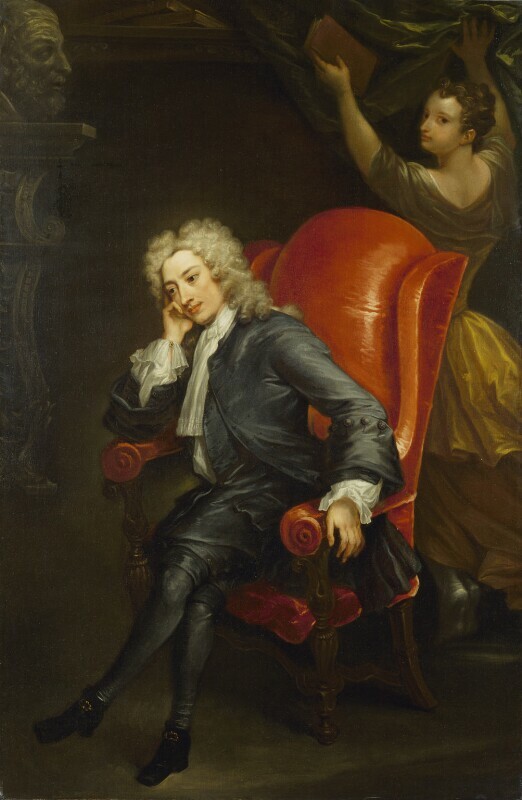 Joseph Addison's play, Cato, premieres at Drury Lane and becomes an immediate success. Treaty of Utrecht, principally conceived by Robert Harley, Earl of Oxford and Henry, St. John, Viscount Bolingbroke, ends the War of the Spanish Succession against France. The accord establishes Bourbon, Philip d'Anjou, on the Spanish throne, with provisos, and forces Louis XIV to recognise a Hanoverian succession in Britain.